Oceania Cruises has a niche almost to itself in the cruise business, above the mainstream lines in terms of service, dining, itineraries, and overall ambience, but not quite up in the stratosphere with the true luxury lines. 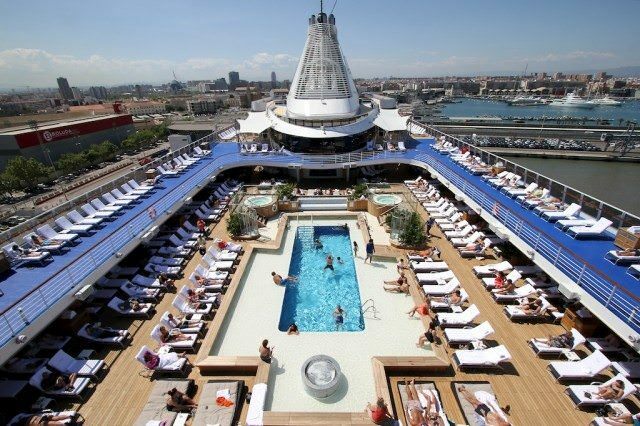 That goes for its prices too, which are higher than premium competitors like Azamara Club Cruises, Celebrity Cruises, Holland America Line and Princess Cruises, but below lines like sister company Regent Seven Seas Cruises and Silversea Cruises. On the plus side, Oceania’s rates often include airfare to the port of embarkation. With the debut of Viking Ocean Cruises’ new Viking Star and Viking Sea, the playing field that Oceania practically invented is narrowing rapidly. Viking’s enigmatic Chairman claims that the Viking Ocean product offers an Oceania-style experience at a fraction of the price. But Oceania, under direction of tireless cruise industry veteran Frank Del Rio, continues to innovate. For its first eight years in business, Oceania operated three near-identical sister ships, each carrying 684 guests. In 2011, though, it introduced the 1,258-guest Marina, which offers the same low-key ambience as the older ships, but carries nearly twice as many passengers and has twice the number of restaurants, plus more personal space per guest. A sister ship, Riviera, was introduced in May 2012. In 2016, a fourth R-Class ship, Sirena, joined the fleet, bringing Oceania’s total fleet count to six. All of Oceania’s ships have a casual, low-key, country club feel, and days are programmed in a relaxed way, with few organized activities and announcements. Instead, the emphasis is on letting guests relax at their own pace, enjoy the ports of call, and just unwind. 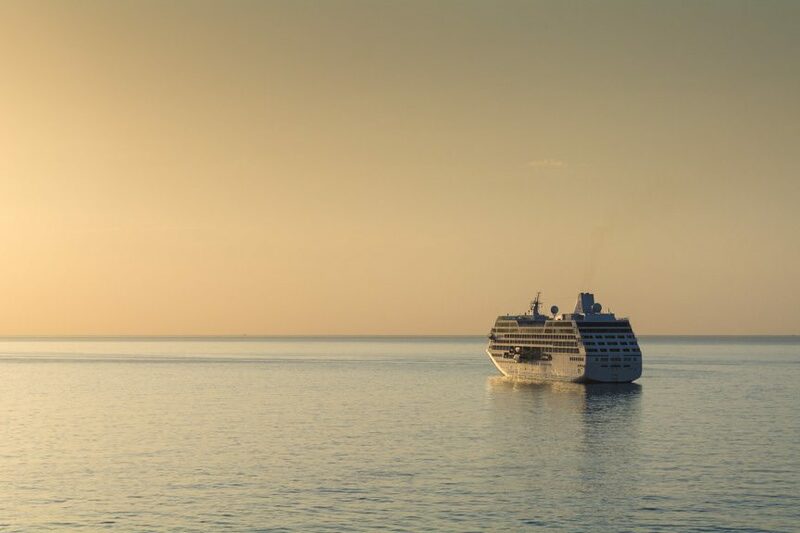 Oceania has also distinguished itself by offering some of the longest world cruises out there: massive, 180-day journeys that sell out every year. Currently, Oceania has a fleet of six ships. These range from the R-Class sisters Insignia, Nautica, Regatta and Sirena to Oceania’s purpose-built beauties, Marina and Riviera. No matter which ship you choose, Oceania has put a great deal of effort into ensuring its country-club-casual atmosphere and high quality standards are present throughout the fleet. 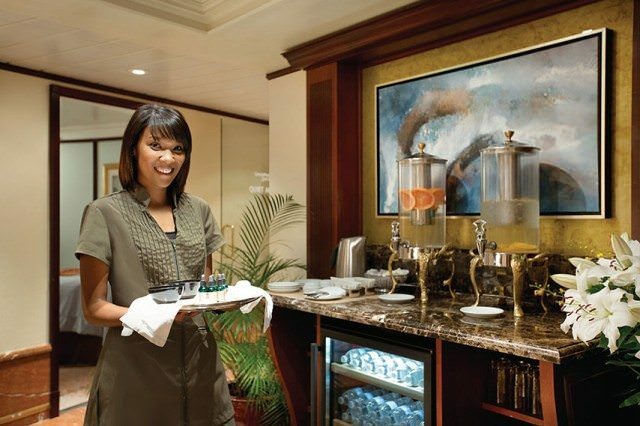 While many guests love the larger Marina and Riviera, the R-Class ships (so named because of their past lives as built for now-defunct Renaissance Cruises) still draw a loyal crowd; Oceania responds by keeping these intimate ships sparkling, adding new amenities and features with each successive refit. Oceania’s Nautica also sports a full-service spa onboard, operated by Canyon Ranch. Photo courtesy of Oceania Cruises. What few activities there are are calm and orderly: enrichment lectures themed on the region you’re sailing; informal health and beauty seminars; cruise standards like bingo and shuffleboard; and classes in fitness, photography, art and computers. Oceania’s Marina, for example, also offers a great Culinary Center for hands-on cooking classes, and an Artist’s Loft manned by guest instructors. Life Aboard Oceania Cruises is designed to resemble the ambiance of a private country club — casual, yet elegant. Staff members are on hand to pamper and provide a high level of personalized service. Oceania strives to create a sense of warm luxury and intimacy. Otherwise, guests are left to their own devices – and that’s just how Oceania’s clientele likes it. If you want to be pampered, head to the spa, run by the famous Canyon Ranch. Those in a reading mood can grab a leather armchair in the ships’ comfortable, old-fashioned libraries. If you feel lucky, you can do a bit of gambling in the small casino. If you feel athletic, hit the gym or pool. In the evening, guests can go dancing or see a movie; sing at the occasional karaoke session; enjoy a pianist playing standards in the Martini lounge, or a string quartet in the atrium; or take in a comedian, singer, or other guest headliners in the main theater. Dining aboard Oceania’s ships is a real event. Photo courtesy of Oceania Cruises. Since Oceania first started up, it’s put a lot of emphasis on dining — both the experience and the cuisine, the latter created by legendary chef Jacques Pépin. Like the luxury lines it emulates, Oceania doesn’t charge for any of its regular dining experiences, which range from casual poolside fare to multi-course meals taken in the ship’s elegant main dining rooms and specialty restaurants. Both main restaurants and specialty options come free of charge, though you have to make reservations for the specialty dining venues. Dining in all ships’ main restaurants operate on an open-seating basis: just wander in whenever you get hungry during open hours, and the maitre ‘d will find you a table. 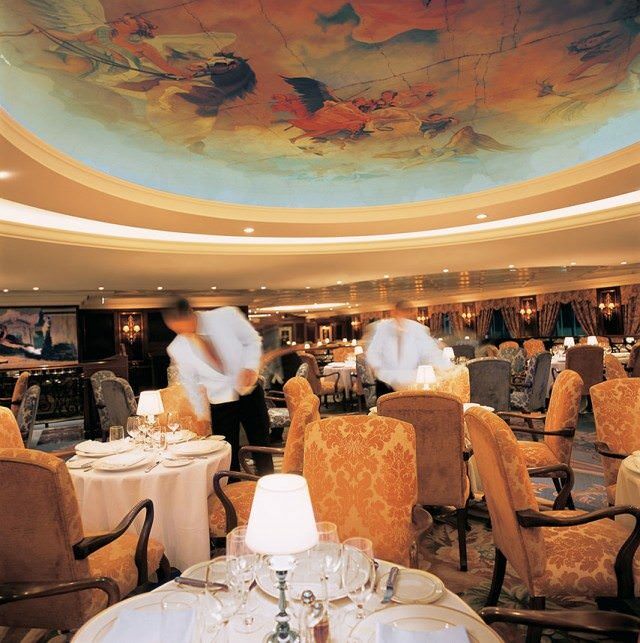 Oceania’s R-Class ships typically feature two specialty restaurants. These include the Mediterranean-inspired Toscana restaurant (Insignia, Nautica & Regatta); the Polo Grill steakhouse (Insignia and Nautica); and Tuscan Steak, which combines the Toscana and Polo Grill venues into one aboard Sirena. Sirena also has Red Ginger, a pan-Asian venue first introduced aboard Marina and Riviera. Marina and Riviera feature four different specialty dining venues, including Jacques, a French-inspired culinary experience named for Jacques Pepin; Red Ginger; Toscana and Polo Grill. Aboard Marina and Riviera, guests can also indulge in La Reserve by Wine Spectator, an exclusive dining experience with a maximum of just 24 guests. Vintage wines and gourmet food pairings are on the menu at this sumptuous venue that features dishes like Bay Scallop Teriyaki Seared on Riverstone, Cream of Porcini with Sautéed Duck Foie Gras, and 72-Hour Slow Braised Short Rib with Gnocchi au Jus. Reservations are required but complimentary, though a wine experience surcharge does apply here. For the ultimate dining experience there is Privée: a private culinary event limited to just 10 people. Dishes are presented on a custom-built table designed by the famed Dakota Jackson and illuminated by a golden Venini chandelier, with menu selections made from Polo Grill, Toscana, or a combination of both. A room reservation charge applies to evenings in Privée, which is available only onboard Marina and Riviera. Oceania offers a vacation that emphasizes fine food and wine, luxurious accommodations and personalized service aboard its four intimate and mid-sized ships. Award-winning itineraries visit more than 300 ports in Europe, Australia, New Zealand, Asia, and the Americas aboard four luxurious, 684-guest ships – Regatta, Insignia, Nautica and Sirena – and the 1,250-guest Marina and Riviera. Explorers who want to stay longer or cruise longer: Oceania Cruises has made of point of building more overnight stays into its itineraries. This allows travelers more time to explore while relieving stress over getting back to the ship on time. Also, Oceania’s itineraries frequently extend two or three weeks, giving travelers a more in-depth visit to a region. Food lovers: Oceania cruise vacations may journey to the far reaches, but Oceania wants its restaurants to be among guests’ favorite destinations. Each ship has four distinct restaurants, with open seating throughout the cruise, and exquisite cuisine is an Oceania hallmark, with its menus crafted by Jacques Pepin, the world-renowned master chef and Oceania’s executive culinary director. People who love to learn: An Oceania cruise offers numerous enrichment series and lectures. Each visit to a new port is preceded by a presentation on the historical background, culture, traditions and language of that destination. Also, celebrity lecturers are frequently scheduled, and each cruise offer a series of culinary demonstrations, dance lessons and arts and crafts classes. World Cruisers: Oceania’s massive world voyages – some of which are as long as half a year – are unmatched in the industry. The one group Oceania will not appeal to is families with young kids. By design, the line’s ships have no kids facilities and offer no kids’ programs. Another group that might want to think twice is smokers: Only a couple small areas on each ship allow smoking — just a small corner of the Pool Deck and a corner of the nightclub. 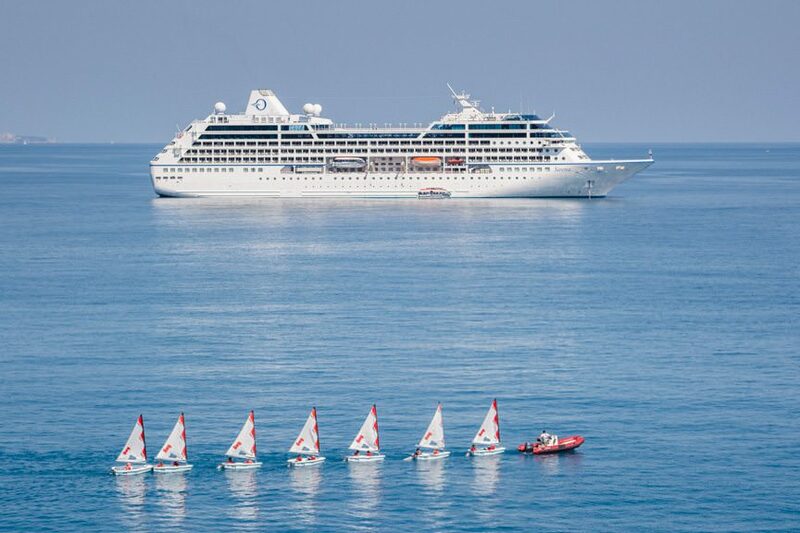 Oceania Cruises has been acclaimed by numerous leading travel and media organizations. Oceania Marina: Coffee Bar With The World’s Best Sea View? Wanted to know more about Oceana’s flight offers. For those that have used their included airfare to Europe, how was the flight schedule? Do they have a lot of layovers? Best to ask Oceania that question. Oceania flight reservations are good once you get to a gate city. However, they do not book flights to gate cities, which means you have to find your own way their. BEWARE, when Oceania books your flight, it may take a few days in which you have to wait to book your flight and prices changes. What we found is it impossible to have a seamless ticket (one booking that was purchased by one entity that takes your from your departure point to a gate city to your port destination). This means you will end up having to go to baggage claim, claim your bags, go through the Oceania Airline, check bags and pay bag fees twice. What happened to us was we ran out of time and our bags did not make the flight. We were without bags for the entire cruise. Our bags arrived as we left the last port at 4PM, just six hour before we had to set them out in the passage way prior to disembarkation. Free air fare if you need to connect is not a bonus, but in all likely hood a cost. On our cruise there were more than 40 bags missing. 40 arrived to the ship three days into the cruise, but many more did not arrive at all. In addition the boutique on the ship is so small that they do not have much of a selection of clothing. They quickly ran out on our cruise. Oceania was unable to help in any way. We had carry on with four days clothes each. We also pack half of our clothes in each others checked bags. We did arrive a full day early and it had no affect. The primary problem was Oceania’s voucher for airfare. This made it impossible to check our bags at our first departure city. When the flight was late leaving and arriving, we had a choice, leave the bags and make our flight our attempt to claim our bags, check our bags and get boarding passes before the international gate closed. We had 20 minutes. Oceania told me they have many bags miss the boat. By my calculation they have a 4-6% bag failure. talking with others who had missing bags, everyone had a common theme; non gateway city. this lead me to believe the Oceania voucher is not a good deal for those not leaving from a gateway city. Interesting. Well, you did everything right, and a lesson learned on this one. Doesn’t work from non-gateway cities it seems.